The Dr. José Ma. Luis Mora Research Institute is a public body in which activities of human resources formation are performed in disciplines such as: history, social science and international cooperation for development. I am sure other higher education institutions can get even more out of this solution, because they already have established research networks, especially in the field of research in technological development, natural, biological and exact sciences. They will have a much wider and immediate implementation. Lync Server came to us researchers through the Computer department. They came to me and said, ‘we have this new package, we will install it so you can try it,’ and it turned out fantastic. Dr. Verónica ZárateProfessor-researcher. Dr. José Ma. Luis Mora Institute. – Reduce costs on long distance phone calls. – Maintain contact with researchers when they are out of town or abroad. – Facilitate the transfer of information and make joint decisions about a problem. – Solve urgent problems quickly and easily. – Send attachments with online collaboration. – Reduction in costs of phone calls; now contact via Lync Voice is used. – The audio and video are excellent. Mora Institute is part of the National Council of Science and Technology, CONACyT. A BA in History, four masters and one doctorate are taught in it. Administratively, it is formed by different areas: from academics and teachers, to students and important support areas such as IT. It was expensive to maintain contact with researchers when they were out of town; there were also problems to facilitate the transfer of information or simply to make a joint decision about a problem. That is why Enrique Ayala, IT deputy manager, along with his team sought a technological solution for their communication problem. The implementation started in 2012 and has worked for about ten months. The solution benefits around 700 users, including the personnel of the Institute, as well as some research centers who borrowed user accounts. To make the introduction, they were supported by Microsoft Partner: Migesa. 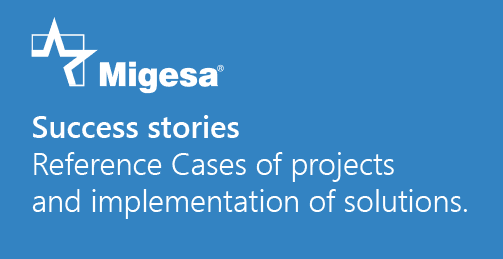 “Migesa is a partner whose engineers widely know the solution, as well as its integration with other Microsoft solutions. This is very important because we integrate Lync Server with Exchange for email and we want to integrate it with SharePoint, where our portal and intranet are,” says Prof. Lazarini. Migesa and Microsoft increasing safety in legal proceedings. Ing. Jesús M. González RodríguezCIO of the Judicial Council of the Judicial Branch of the State of Nuevo León. To establish a videoconference system to prevent the transfer of prisoners to court. – The risk that a prisoner could escape during the transfer from prison to court was reduced. – Personnel and operations costs were reduced by performing this process. – Productivity of the involved personnel increased, allowing remote connectivity. – Assaults on personnel of the Judicial Branch of the State were avoided. In recent years, the Judicial Branch of the State of Nuevo León has significantly evolved in their processes to achieve better solutions that allow to efficiently process the large workload in Courtrooms and Court. Through the Computer department, in charge of Jesús M. González, solutions have been designed to support the strategic vision of the Judicial Branch, from the digitization of records for consultation at the Virtual Court, to the technological design of courtrooms for Oral Trials, which were implemented in Nuevo León in 2004 as a historical change process in the justice system of our country. Video recording of oral trials was also included for consultation at the Virtual Court. There was this need for an efficient and safe process that could replace the physical visits of prisoners to courts; these legal proceedings involved suspects prosecuted for crimes ranging from felonies to misdemeanors, and in both cases there is a whole operation to transfer the criminal from prison to court, which always poses the risk of escape, besides the fact that the judges and their clerks sometimes were assaulted by prisoners while they were face to face receiving a notice or during a hearing or statement, “suddenly the prisoner made things that made the authority uncomfortable, such as hitting something, spitting or other similar situations. Then we started to figure out how to make these hearings remotely, in order to avoid incidents of any kind,” said Jesús Martín González Rodríguez, CIO of the judicial council of the judicial branch of the state. Although traditional videoconference systems fulfilled its role, they had the disadvantage of being very expensive and requiring dedicated spaces and a scope limited to only the purpose for which they were acquired, but with the Unified Communications scheme, collaborative work is potentiated because the Judicial Branch already has the necessary infrastructure for their use. With Office Communications Server R2, a new way of conducting video conferences was implemented, from the courts and courtrooms of the Judicial Branch to the Social Rehabilitation Centers of Topo Chico, Apodaca and Cadereyta, including the last two in this project, with the advantage of bringing high definition equipment for videoconferencing to the personnel’s desktops, which allows to have all work files within reach and gives the opportunity to use it for other purposes as well in video-call sessions, voice over IP and instant messaging with the Microsoft Office Communicator R2 client, which integrates perfectly with Outlook. To avoid transferring a prisoner to court, the IT department of the judicial branch of Nuevo León decided to try a video conference system to facilitate these legal proceedings, said Alejandro Hernández Ramírez, Manager of MIGESA Professional Services, certified partner of Microsoft, adding that his approach with the client occurred when they were already studying another solution. However, Microsoft solutions turned out to be more adequate for the needs they required inside the Judicial Branch of the State. There is currently an initiative by MIGESA to strengthen these technologies within the Judicial Branch of Nuevo León through complements that can add functionalities on the same investment. This was explained by Alejandro Hernández Ramírez. “This can apply to the part of telephony, to connect switchboards of the Judicial Branch so they can, through that interface, make phone calls to landline and mobile numbers,” adding that other functionality in which they might be working with the customer is the addition of email to this solution “so that the user has a single point of access to all this information be it instant messaging or voice messaging and email from a single point,” explained Hernández. The implementation of Communications Server 2007 was extremely well received by the highest judicial authorities of the state, since users adapted quickly and effectively to the solution because it is very easy to assimilate and understand; nowadays, 1,200 (twelve hundred) monthly hearings are held by this means, so the savings have been substantial; the transfer from prisons to court is about 20 kms. and different vehicles were used, so the cost/benefit has been significant. Although due to legal reasons some prisoners must be transferred to the courts, 80% of legal proceedings are carried out through the video conference system. “The tool is definitely useful for us and for any state of the country to avoid unnecessary costs and increase safety”, said the official.